Here is a beta of a simple little XMB mod that allows the user to switch between 5 pre prepared boot_plugins.txt files. To install it initially, Simply copy the 2 category network xmls to dev_blind/vsh/resource/explore/xml/ and then install the tiny package. Then you can place your 5 boot_plugins.txt files into the "boot_plugin_x" folders which you will find at dev_hdd0/game/BOOTPGTSW/USRDIR/ (one txt file in each folder). Now this went from the idea stage to completed in just a few hours last night, getting the PVR set up and uploading the video took most of that time. I knows its a bit crude but it does the job. If you want to you can edit the xml file so it says which plugins are included in each "slot" like I have done in the screen shots/video. Note 3: After installing this ALL boot_plugins.txt files in the 5 folders are blank, so add your own txt files before you use it. Note 5: If you want more or less "slots" you can edit the xml quite easily. Here is a quick video demo showing how it works. 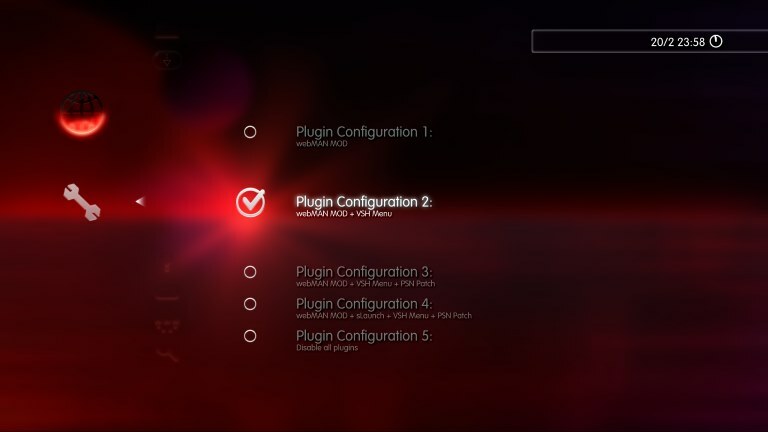 When you select your desired configuration the PS3 will reboot almost instantly with your new boot_plugins.txt file active. bitsbubba, MHAF99, STLcardsWS and 6 others like this. Cheers, the vision @STLcardsWS had for a plugin manager was much better than this though, but the nice thing about this option is that its integrated into the XMB. Damn I wish we could mod the settings category, I really don't like putting things like this in network or game or user categories, I don't mind with XMBPD as it fits there. 0_obeWAN, Berion and Sdw100 like this. Did I something wrong? I haven't subtext under "radio buttons", they are empty, and when I choose one of five "options" my plugins.txt goes empty 0B file. I "rebugificated" this plugin, but any XML etc. are untouched (so this cannot be my issue). Rebug 4.81.2 with webMAN Mod v1.47.2. Yes it's normal it's only the structural base code, you need to code your own plugins as desire. At the moment I use VSH with all the plugins I test because no conflict found with others plugins and permit to Reload webMAN and Reactive the Boot plugin manager. Here is the one I test. Sdw100, Berion and DeViL303 like this. citra mulia, Sdw100 and DeViL303 like this. sMAN should unload properly (it does with /quit.ps3 and combo-shortcut). What method is used in vsh menu to unload sMAN (unload by name/slot..)? p.s. I just tested calling cobra_unload_vsh_plugin(slot) from another plugin and sMAN unloaded properly (no crashes, no weird behavior). citra mulia, Sdw100, bitsbubba and 2 others like this. ricardo, Zoilus, STLcardsWS and 2 others like this. I guess this is an issue with vsh menu. As I said when I unload sMAN from another plugin with "unload_vsh_plugin" cobra core function - it unloads. Not related to the above posts, but, I was thinking, Now that we have the source to the custom xai plugin sprx used by CFW Tools/Settings, In theory we could add the 5 copy operations to that as custom static commands and then this would already be cobra and webman independent. kozarovv and 0_obeWAN like this. Which functions would you need exactly? The abilty to be able to just use the copy command with the xai plugin and pass a variable on with it would be even better of course. Ok. I don't foresee any obstacle whatsoever... I will look into it as soon as possible & let you know. Actually what bothers me more at the moment is the polling code used in wMM for pkg handling (remember how wMM checks every so often to see if a download is over for certain post download processes?). I would prefer to avoid this kind of code in a system plugin. bitsbubba, kozarovv and DeViL303 like this.